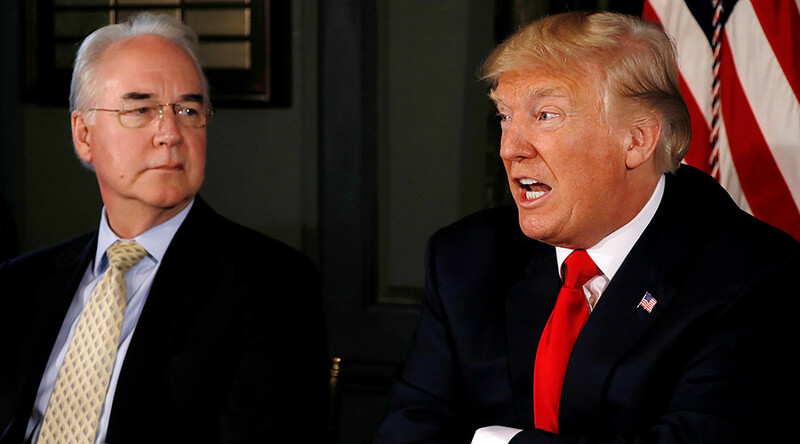 Secretary of Health and Human Services Tom Price has offered his resignation amid a growing scandal around his use of private planes. President Donald Trump intends to designate the acting assistant secretary for health to fill his position. The White House issued a statement Friday, which said that Trump accepted Price’s resignation and intends to designate acting assistant secretary for health Don Wright to serve as the acting secretary effective at 11:59 pm. Trump told reporters that he was going to make a decision on Price on Friday, adding that he was “disappointed” by the wasteful spending. “I was disappointed because I didn't like it cosmetically or otherwise,” Trump said. “This is an administration that saves hundreds of millions of dollars on renegotiating things." The total cost of Price’s overseas trips have cost taxpayers more than $1 million since May, according to Politico. Price offered to write a personal check for $51.887.31 to the US Treasury to cover the cost of his seat on the flights he chartered. “The taxpayers won’t pay a dime for my seat on those planes,” Price said. Price’s departure came after the Office of Inspector General (OIG) began a review of whether Price’s 26 charter flights were appropriate. Lawmakers on both sides of the aisle called for senior Trump officials to stop taking private flights until the OIG completes their review. I've long held @SecPriceMD wasn't fit for office, the only question now is whether he should be allowed to take taxpayers for hundreds of thousands of dollars on his way out the door. Other members of the Trump administration have also come under fire for their use of private jets, including Interior Secretary Ryan Zinke, who Politico reported had paid $12,000 for a charter flight to attend events in his hometown. Treasury Secretary Steve Mnuchin and Environmental Protection Agency Administrator Scott Pruitt have also reportedly taken private flights at taxpayer expense.